Two days after scoring $50,000 from a private foundation that will be turned into $200,000 thanks to a state matching program, the urban metro campus of Gateway Community & Technical College received more good financial news on Thursday. 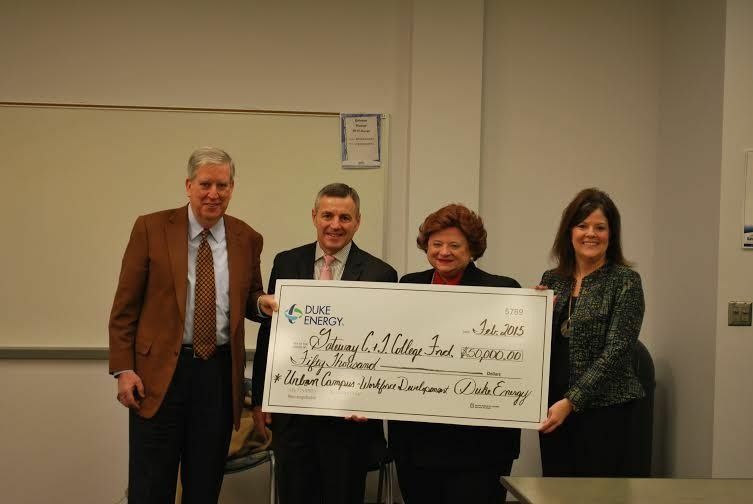 The Duke Energy Foundation awarded a $50,000 grant to Gateway Community and Technical College Foundation. The Grant will help support the Gateway Foundation’s efforts to help the college develop the Urban Metro Campus in downtown Covington. Lee Flischel, Chairman Emeritus, Gateway Community and Technical College Foundation; James Henning, President, Duke Energy Ohio and Kentucky; Maryanne McGowan, Manager, Business Strategy & Implementation, Duke Energy; Rhonda Whitaker, Government & Community Relations, Duke Energy Kentucky. Meanwhile, the Gateway Foundation Board, the fundraising arm of the college, announced four new members this week. “We are pleased to welcome four talented and well-known community leaders whose expertise in financial management and civic affairs add significant strength to the current Gateway Foundation Board,” said James Parsons, chair of the Foundation board. Kenneth Paul a communications consultant and retired executive of Cincinnati Bell; and Lori Ritchey-Baldwin Chief Financial Officer, St. Elizabeth Healthcare. Cason works with high-net-worth families with investments, private banking and estate and financial planning in his role with PNC Bank. Previously he was with Bernstein Global Wealth Management, and sold, financed and implemented complex hospital solutions to major hospitals in the Tri-State with Stryker Medical/Stryker Finance. From 2000-2005 he represented Merck Pharmaceuticals in the Northern Kentucky area. Previous to that he served as operations manager for Cincinnati Bell’s business repair center for large business data and phone networks. Michael is on the Boards of the Kentucky Symphony Orchestra and Blessed Sacrament Boosters. He also serves on the Board of Advisors for the Xavier University Williams College of Business and Northern Kentucky Chamber of Commerce. He resides in Crestview Hills. With over 30 years of experience as an accountant and senior-level manager, McGowan has spent the past 14 years in the energy industry. She currently is responsible for stimulating business markets in the fields of energy efficiency and energy conservation. She serves on the Consortium of Energy Efficiency, the Association of Energy Engineers, and the Council of Women in Energy and Environmental Leadership. Maryanne recently completed service on the Steering Committee for an Electric Power Research Institute research project of “Electricity Use and Management in the Water Supply and Wastewater Sectors.” She is presently serving on the advisory board for the Water Environment Research Foundation for the project of Barriers to Energy Efficiency and Recovery. Additionally, she has been active in workforce development and the promotion of STEM career development and education in K-12 Schools as well as at the collegiate level, especially with Raise the Floor. She is a sought after speaker on energy efficiency and energy management on the national and regional level. Her expertise includes fiscal management, economic analysis, mergers and acquisitions, process design and improvements, resource planning and sustainable energy strategy. Paul is a communications consultant and retired executive of Cincinnati Bell. His 41-year career with the telephone company included management and non-management positions in sales and sales support and involved the direction of eight to 160 employees. He served as Campbell County Judge Executive, Campbell County Commissioner, Councilman and Mayor of the city of Southgate and was a Southgate police officer. The past chair of the boards for Tri-ED, Northern Kentucky Health Development and the Northern Kentucky Area Development District, he also served four terms as president of the Campbell County Council of Governments. He was appointed to Gateway’s founding board by Governor Paul Patton in 2001, was reappointed by Governor Ernie Fletcher in 2007 and was reappointed by Governor Steve Beshear in May 2014 for a term expiring November 15, 2019. Ritchey-Baldwin’s responsibilities include oversight of all financial services operations, revenue cycle management, managed care and information systems for the $1 billion St. Elizabeth healthcare system. She previously served there as vice president of finance. Prior to joining St. Elizabeth Healthcare she held various positions as vice president of internal audit, vice president, controller and chief accounting officer for Chiquita Brands International. She also held executive positions at MeadWestvaco Corporation and Deloitte & Touche. She is a certified public accountant and a member of the American College of Healthcare Executives, American Institute of Certified Public Accountants, and Healthcare Financial Management Association. In addition to her role as CFO, she is treasurer of the St. Elizabeth Board of Trustees, a board member of St. Elizabeth Physicians and a board member for the St. Elizabeth Provider Network. Ritchey-Baldwin has been a sought after speaker and presenter at the national level. The four new members were elected to the Foundation board during the fall of 2014. Their addition brings the total number of executives serving on the board to 30. The Gateway Foundation board members represent a broad array of industries and organizations. In addition to Parsons and the new additions, board members include Steve Brunson, Norm Desmarais, Ben Dusing, Steve Frank, Shelley Frommeyer, David Gooch, Trey Grayson, Kim Halbauer, Rich Hempel, William Hesch, Ken Lucas, Executive Director Laura Cook Kroeger, Candace McGraw, MaryAnn Pietromanaco, John Schoener, Jeanne Schroer, Debbie Simpson, Alice Sparks, Margaret van Gilse, Paul Verst, and Robert Zapp.